The projects aims at supporting the Moroccan efforts in implementing a performing energy policy, responding to its economic, social and environmental requirements, which could support the integration, in a long term, of Moroccan energy market with EU's one. In order to optimize the management of the downstream petroleum industry, and accompany the development of the market and the infrastructures of the natural gas in coherence with the international and EUstandards, an appropriate legal and regulatory framework is set up and the institutional capacities of the main Moroccan actors (in particular the Ministry of Energy and Mines, water and Environment - MEMEE) are strengthened. 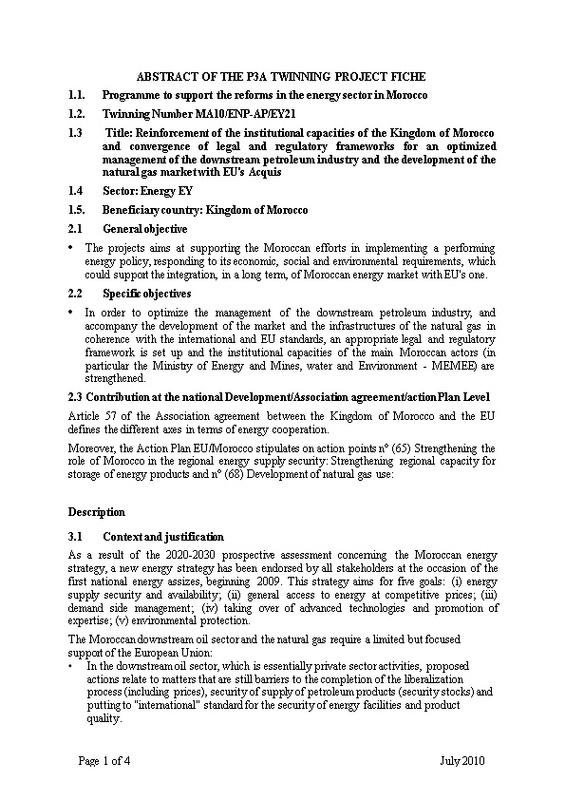 Article 57 of the Association agreement between the Kingdom of Morocco and the EU defines the different axes in terms of energy cooperation. As a result of the 2020-2030 prospective assessment concerning the Moroccan energy strategy, a new energy strategy has been endorsed by all stakeholders at the occasion of the first national energy assizes, beginning 2009. This strategy aims for five goals: (i) energy supply security and availability; (ii) general access to energy at competitive prices; (iii) demand side management;(iv) taking over of advanced technologies and promotion of expertise; (v) environmental protection. In the downstream oil sector, which is essentially private sector activities, proposed actions relate to matters that are still barriers to the completion of the liberalization process (including prices), security of supply of petroleum products (security stocks) and putting to "international" standard for the security of energy facilities and product quality. In the field of natural gas, as regards supporting the MEMEE, institution that might/shall in the future regulate the gas market, and the other stakeholders, in order to finalize the regulatory framework, define the structure of the industry and clarify the contractual framework of the market. In the downstream oil sector, the partners are mainly oil companies: international companies, Moroccan groups in the distribution and shareholder of SAMIR. Outside the EC, only the World Bank is contributing to studies. We find the same partners and the private sector in the development of natural gas, along with the ONE. The steering committee of the programme is composed of the Ministry of Energy and Mines, Water and Environment (MEMEE), the Ministry of Economy and Finance of the Kingdom of Morocco, and the European Union Delegation in Rabat. The Ministry of Energy and Mines, Water and Environment (MEMEE)is the recipient of this twinning project. The following administrations and state organisations of the Kingdom of Morocco will be involved in the realisation of this project: Directorates inside the MEMEE (“Direction de du Contrôle et de la Prévention des Risques” "Direction des Combustibles et Carburants"),theNational Laboratory for Energy and Mining;the Ministry of General Economic Affairs, and the Ministry of Interior which plays a central role in the prevention and the crisis management. 5. Budget The maximum budget for this twinning is estimated at 1.100.000Euros.